It was only a matter of time before one of the popular YouTube content creators had a catastrophic failure similar to what my wife and I experienced about 4 years ago. To recap on that situation, a slight crack in the outlet thread on the CPU block allowed coolant to leak into the lid outside the O-ring, and eventually sprayed out onto the system components and catch fire. Just from the thumbnail, you can tell the leak was far, far more extensive than what my wife’s system suffered. And the photos and B-roll footage in the video shows the coolant got everywhere – including onto the RAM. Now there were several saving graces to this situation, as Kyle notes. The mainboard is the ASUS Sabertooth X99 – the same mainboard in Mira. The “armor” on the mainboard is designed to pull heat off all the components while also better directing airflow across the power delivery around the CPU. It also sheltered those same power delivery components from spraying coolant. Without that protection, the coolant could have created shorts between components on the mainboard. The fire risk cannot be understated, even with short-circuit protection in power supplies. The same with the GPUs. Speaking from personal experience on that one. So how did this occur? And could it have been prevented? 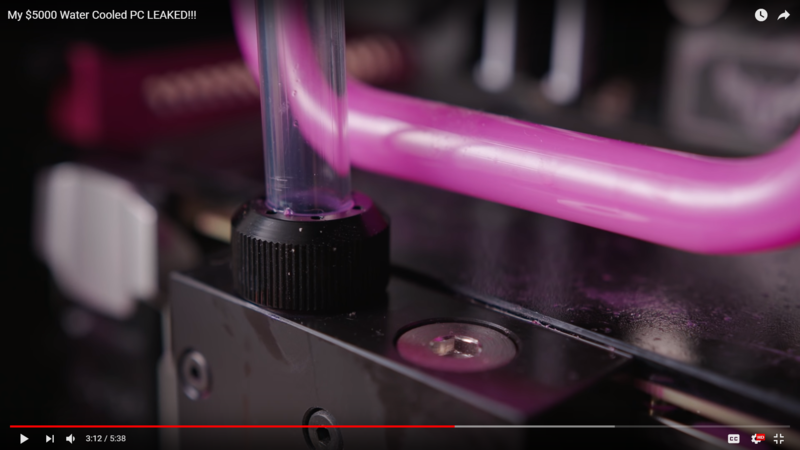 Kyle said in his video that the leak came from the outlet on the graphics card bridge due to the tubing coming loose in the fitting and spraying coolant all over the place, even showing the cap on the hard tube compression fitting was also loose. When using rigid tubing, the tubing must go into the fitting straight. 90° about dead on. And with PrimoChill’s Revolver fittings, that cap won’t go on easy unless the tubing in properly seated into the base at a near-90° angle. The cap should go on without any resistance and without any contact to the tubing while threading it down. At the 3:02 mark on the video at the top of the article, you can see small cut marks in the tubing, where the cap for the Revolver fitting cut into the tubing as he tried to secure it. And you can more easily see as he pushes the tubing back into the fitting that the tubing was not sitting at a proper 90° in the fitting. Click here to view just the image. This alone means the tubing was at too steep an angle. And instead of the cap going easily and cleanly onto the fitting, it cut into the tubing. Kyle should have felt that resistance. But rather than taking it as a sign he needed to redo the tubing – likely because he didn’t want to – he instead forced the cap onto the fitting. Taking as a false sign that everything was fine when he finally was able to get the cap seated. This is why I said in my article defending AlphaCool that you must double-check everything when making a custom water cooling loop. And when using rigid tubing and compression fittings, you need to look for those cut marks in the tubing. As those cut marks are an indication you didn’t do it right. The resistance alone trying to secure the cap will also tell you the tubing is at too steep an angle. Again, that means you didn’t do something properly, and you need to redo it. So what ultimately happened here, then? In short, there was some springback with the other end of the tubing in the CPU block. Little by little, the tubing started to creep out of the fitting, with fluid pressure building inside the fitting the more it crept. The fluid pressure also enhanced any springback effect in the tubing. Eventually it came loose enough the fluid pressure could push it even more until it sprayed everywhere. And in the end, not only did Kyle not properly bend the tubing, he also never took the system down for maintenance. He should have caught this by inspecting the loop, whether during a maintenance cycle a year ago or 6 months ago – or 5 minutes after he assembled everything and before adding the fluid. And if he did drain the loop for maintenance between now and the time he built it, he didn’t inspect anything – only drained, flushed, and put in new coolant. One other thing to note before finishing this out. Some in the comments section to Kyle’s video said that he should’ve used LocTite on the fitting caps, after noting the cap was loose. DO NOT DO THAT. If you cannot unseat the cap on the fitting without unseating the fitting, the cap is too tight. And LocTite ThreadLocker will make it impossible for you to disassemble the loop at a later time as it won’t allow you to get the cap off the fitting. One measure I found online estimated about 50 ft-lbs of torque just to break the bond, well beyond the definition of “hand tight”. Meaning disassembly would require literally pulling your loop apart, or cutting the tubing. It also means you cannot reuse the fittings without risking destroying them trying to get the caps off. To repeat, and repeat, and repeat, since it must always be said: custom water cooling has risks that you won’t find with AIOs and air cooling. And AIOs still have a risk you won’t find with air cooling. That’s just the nature of the beast. And if you decide to custom water cool your system, you must be open to accepting and accounting for that risk. The very, very low risk involved provided you, again, take all proper precautions, starting with selecting quality parts.